A backyard swimming pool is a complex system of pumps and pipes, heating and thermostat controls. Pools are designed and installed by professionals, and periodic maintenance and repair work should also be left in the hands of professional pool repair experts. Do-it-yourself repair work can be much more costly than having a licensed professional take care of the project. If the materials involved are still covered by warranty, an expert repair technician may be the only choice in order for the warranty to remain valid. Before attempting any major repair or refurbishing work on an existing swimming pool, consider the short-term costs vs. the long-term benefits of having the work performed by experienced personnel. Most homeowners are unfamiliar with how the mechanical components of their pool operate. If something goes wrong it can be extremely difficult for the novice to pinpoint the source of the problem. Professional pool repair experts can quickly analyze the working condition of all pumps, motors, filters, chlorinators, feeders, heat pumps, and blowers. These field technicians are specially trained in the areas of electrical component and motorized equipment. Their repair work is also guaranteed and covered by its own separate warranty. 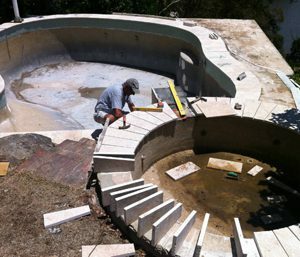 Depending on the original construction of the pool, the materials used will vary and may include the installation of a sublayer of mesh and plaster. If a crack develops, water seepage can cause a great deal of damage to the inner sections of the pool walls. Repairs of this type are very costly for the homeowner to complete because of the specialized materials needed for the job. In addition, skill at cementing or plastering, affixing tiles, and water sealing are needed in order for the job to be completed successfully. A professional pool repair company comes prepared with all necessary equipment and tools. Crack repairs can be completed in less than one day and at a fraction of the cost incurred by homeowners who attempt this type of service work on their own. This is the best way to ensure that the pool and its mechanical components are in good operating condition. Most motors parts, valves, feeder lines, blowers, and heat pumps show signs of fatigue and loss of structural integrity over a period of time. However, it takes an expert to properly diagnose the problem. Calling in a professional pool maintenance technician is the best way to take care of small problems before they become big ones. Drain-and-clean services, chemical checks, motor and pump operations checks, and sediment removal are easily performed at an affordable price by licensed, expert service personnel.